If your plans for the weekend revolve around a couch, the TV, and as much Olympics coverage as your eyes can handle, then you’re in luck: the official Rio 2016 app is here to help guide your days ahead. And the rest of the apps can also be enjoyed amidst that comfy cocoon of air-conditioned bliss… or anywhere else, really. Mobius: Final Fantasy is Square Enix’s latest attempt to transform the role-playing epic into a free-to-play grind, while Google’s Verne: The Himalayas turns Google Maps into an educational journey. Also new this week is the non-beta release of Apple Music, along with the thrilling space escapes of All is Lost. Fire up the Play Store and grab a few new apps, no matter what your weekend plans are. Rio 2016 is the official Olympics resource app, complete with adorable mascot in tow. A handful of soccer matches and archery events are already in the books, but tonight’s lavish opening ceremony marks the official start of the Rio 2016 Summer Olympics. And if you plan on following the massive, international competition over the next couple weeks, you’ll probably want an app plastered on your home screen. Well, here’s Rio 2016. 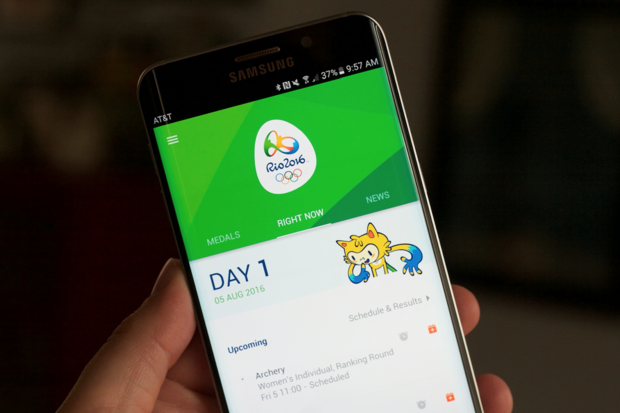 The official app, which is backed by Samsung but not limited to its devices, has all the Olympics info you need, including results, news, medal counts, and information on each sport, the players, and venues. It’s a pretty straightforward app, really, but it’ll get you all the info you need pretty easily—and if you’re down in Rio de Janeiro to scope out the action for yourself, the app has local info to enhance your stay. Mobius looks really nice at a glance, although everything’s pretty fuzzy up close. Mobius is quite seriously the third different Final Fantasy game to hit the Play Store over the last few weeks, and they’re all totally distinct. Final Fantasy VII is a premium port of a PlayStation classic, Final Fantasy: Brave Exvius is a new game inspired by the 16-bit era, and now Mobius: Final Fantasy is a combat-centric, free-to-play game that serves up the series spirit in a different form. You’ll find turn-based combat, fantasy spells, and even the familiar job system, although here the game simply routes you from battle to battle as you amass a deck of item and magic cards. Mobius doesn’t really play like a classic Final Fantasy, but it has the look of the more modern entries (and the convoluted storytelling), plus there are enough throwback references to appease the die-hards. We’ll see if that’s enough to hook longtime fans. Google’s digital mountain range is yours to explore in Verne: The Himalayas. It’s super cool to see some of the ways that Google has used its immense mapping power to deliver experiences for people who don’t need to leave the home. Treks are one result, showcasing amazing places around the world, and now Verne: The Himalayas is another way that Google is leveraging its Maps platform to spotlight somewhere amazing. Here, Verne takes the form of a kid-friendly app that lets you freely explore the 3D mountain range using a couple of digital control sticks. As you scale the cliffs, you’ll encounter narration bubbles and have the opportunity to soar on a hang-glider, for example, or sled down a hill. It’s just a breezy and fun way to learn about a new place, and the cartoonish yeti character and easy controls make it a good pick for the family. Apple Music added videos and an equalizer—and ditched the beta branding. Nine months after first hitting the Play Store, Apple has finally decided to pull the beta tag off of Apple Music and call it a full release. The subscription service, which might seem a bit out of place on an Android phone, matches up well to Spotify on a lot of key features, save for maybe the biggest: it doesn’t have a free, ad-supported membership option. Still, there’s a 90-day free trial available to new subscribers. If you haven’t given it a look since the initial beta beginning, Apple Music has since added the missing music videos and now has equalizer settings, to boot. You’ll find millions of songs, of course, including an increasingly sizable stack of exclusives and the Beats 1 live radio station. Apple Music is about to get a major overhaul in iOS 10, but it’s unclear whether that will extend to Android as well. In the meantime, however, anyone scared off by Apple Music’s beta tag needn’t stay away now. Can you get everyone out safely through these intense obstacle courses? All is Lost ($1) may not have the most upbeat title around, but it’s pretty entertaining all the same. This side-scrolling runner hails from the makers of Block Fortress and Heroes & Castles, and finds you in charge of guiding a series of crew members out of a doomed spaceship. Doing so requires an array of jumps, slides, and swipes to interact with the environment, and you’ll need to be speedy and precise to get everyone out. That’s not an easy task, of course, as the combinations of moves can throw you off, and you only have so many attempts for each crew member before they’re lost forever. All is Lost puts a clever twist on the usual format for these games, and while it may not have a ton of bells and whistles, the core experience is plenty fun.